There has been a remarkably constant growth rate of scholarly journals since the 1600’s (De Solla Price, 1963, p. 17). Mabe (2003) calculates the average annual scholarly journal growth rate at 3.46% per year from the 1600’s to the present day, with an increase to 4.35% from 1946 to 1976 and subsequent fall to 3.26% after 1976. This issue of the Dramatic Growth of Open Access highlights 30 indicators of open access growth that are beyond this background growth of scholarly works - in many cases far beyond, with a range of percentage growth from 5 - 89%. In some cases, high percentage growth reflects early start-ups (low starting figures), but in other cases there are very high growth rates on resources that were very, very large to begin with (these are the highlighted numbers below). Note that some numbers are rounded for ease of understanding; if precise numbers are required, please download the full dataset from the DGOA dataverse. A special congratulations is in order to arXiv for recently surpassing the milestone of over 1 million documents. Note that these 30 indicators likely underestimate the growth of open access beyond the ordinary by a large factor, as this series focuses on just a few indicators of macro level growth of open access. To continue the momentum in 2015 open access advocates are encouraged to remember the vision of open access as unprecedented public good and not get caught up in the minutiae of implementation. Although the focus of this series is the numbers, a special mention to an exceptional open access policy recently announced by India's departments of Biotechnology and Science and Technology which represents a new model OA policy for the whole world. 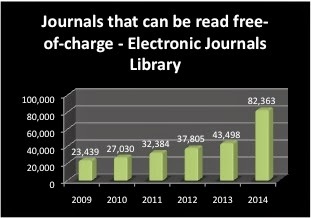 89% growth - over 38,000 more journals that are free-to-read: the libraries collaborating on the Electronic Journals Library service added 38,865 journals that are free-to-read in 2014 for a total of 82,363 journals that can be read free of charge. This figure encompasses not only the fully open access, peer-reviewed journals included in DOAJ, but also the many journals that are free to read after an embargo period or that are of interest in an academic context without necessarily being peer reviewed. 25 publishers for a total of 79 (46% growth). As open access moves further and further from idea to reality, it's all too easy to get caught up in the minutiae of implementation: the procedures of developing open access archives, journals, books and other works and the development of the technology and services to make it happen, and to make the works attractive to use. In the process of developing OA initiatives, it may well be useful to develop and implement a variety of standards, new metrics and technical procedures. But in the process let's not confuse the means with the ends - let's keep our rationality rational (Morrison, 2012) and focused on the goals that we really want to achieve. The recently announced new open access policy of two of India's science departments represents the best of funding agency open access policy to date and includes important advances. There is a focus on green or open access archives and a call to develop the institutional repository system to implement the policy. This will ensure that the results of research funded by India remains open access and remains available to Indians - there is no substitute in OA policy for ensuring local control. The maximum embargoes are six months in the sciences and one year in the humanities and social sciences. The major advance is inclusion of the San Francisco Declaration on Research Assessment instructing evaluators not to consider impact factor or other metrics in assessing the work of researchers, but rather focus on the quality of the work per se. This is an absolutely critical step in addressing the systemic dysfunction in the scholarly communication system I have described elsewhere (Morrison, 2012), facilitating a shift to rational rationality, a system that is free to prioritize the advancement of scholarly knowledge, the knowledge commons, rather than the imperfect measures people have devised as heuristic devices. Morrison, H. (2012). Freedom for scholarship in the internet age. Doctoral dissertation, Simon Fraser University, Department of Communication. The second chapter discusses the theme of irrational rationality, drawing from the work begun by Weber. This is also called instrumental rationality, and in brief is our tendency to develop tools, techniques and measures to help us achieve our goals, only to become slaves to the measures. If you have news about the dramatic growth of open access in 2014 that you would like to share with others, please do so as a comment to this post. This year I'm skipping the usual early year-end edition due to lack of time, but the final year end (Dec. 31) will continue as usual. Please note that I may not be keeping up with of the usual social media for OA, so reader alerts via comments would be most appreciated.